So this month’s cocktail challenge is simple: make a drink using vermouth. This one snuck up on everyone, so our host at Cocktalians chose an ingredient that most of us have on hand at home. Cocktalians points out that the tough part here is narrowing down the field, since this particular category of spirits allows for myriad possibilities. But I didn’t need to give this one much thought. 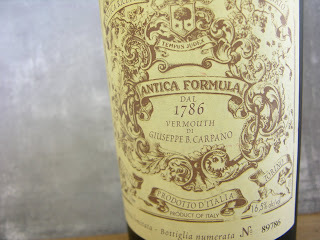 Recently I’ve been enchanted by Carpano Antica, a sweet vermouth from Italy. I used it to doctor the classic Manhattan, which I’ve always really wanted to love. The problem for me with the Manhattan is that I’m always left somewhat disappointed—in the end I would have rather just enjoyed some bourbon neat. 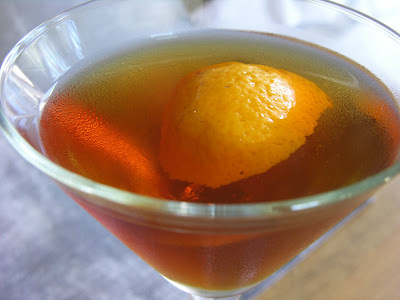 But using the Carpano Antica and orange bitters . . .problem solved. Pour all ingredients in cocktail shaker filled with ice. Stir for 30 seconds. Pour into a chilled martini glass (or whatever you want to drink it out of).